"Way to go! You did it! We are so proud of you." That was the message posted on the wall of the Pediatric Critical Care Unit (PCCU) at Children's Hospital at Montefiore (CHAM) on December 14. Some 30 doctors, nurses and staff members lined either side of the red-carpeted corridor, with pom-poms and tambourines ready. Jadon and Anais MacDonald reclined comfortably side-by-side in a little red wagon pulled by their parents, Chris and Nicole MacDonald, as it made its way slowly past members of the CHAM team that has taken the family through an almost unimaginable journey of healing. Many hugs and more than a few tears accompanied emotional farewells. Jadon and Anais MacDonald were born joined at the head and became members of the Montefiore family nine months ago when the long process of separating them began. Multiple surgeries culminated in the successful separation of the twins in a procedure taking more than 20 hours on October 14. The surgical team was led by Dr. James Goodrich, director of Pediatric Neurosurgery at CHAM and Dr. Oren Tepper, Montefiore's director of Craniofacial and Aesthetic Surgery. 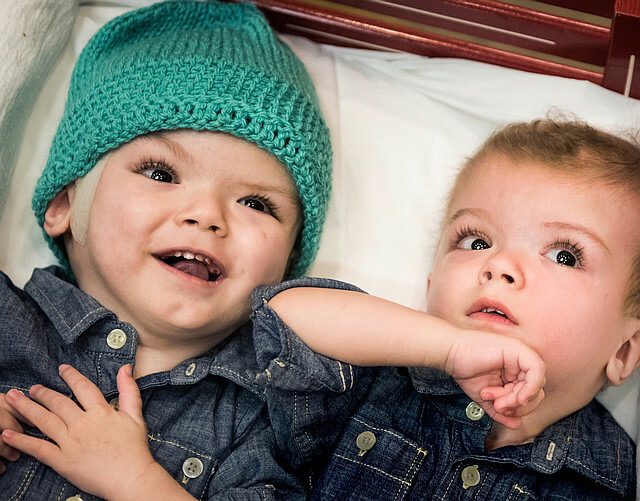 The twins weathered many challenges after the surgery; now they're moving on to the next stage of recovery at a rehabilitation facility where they'll undergo physical, occupational and speech therapy. "IF I MAY, I JUST WANT TO BE THEIR VOICE AND SAY, 'THANK YOU FOR GIVING US, JADON AND ANIAS, A HOPE AND A CHANCE FOR A NORMAL LIFE.'" —Christian MacDonald, speaking for his children, to the Montefiore community. On December 12 the Grand Hall at the Moses Campus was transformed into a magical winter wonderland by ‘elves' from Montefiore's Child Life Program and the Department of Marketing and Communications. 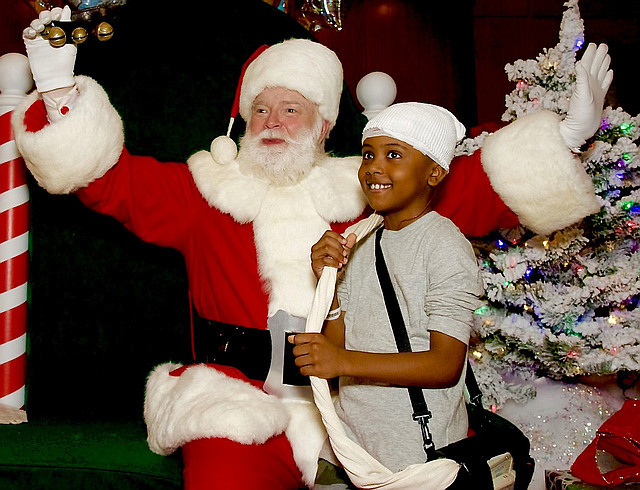 When all was ready, Children's Hospital at Montefiore patients arrived with their families to spend some time with Santa. Every young patient had the chance to sit on Santa's lap, share their Christmas wishes, have a photo taken and receive a special gift from Santa. The merry old gentleman finished the day visiting children who could not leave their rooms, ensuring no child missed out on the holiday fun! 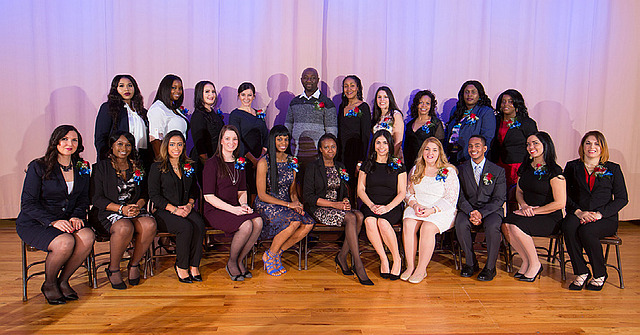 Congratulations are in order for the 21 members of the Montefiore School of Nursing, December 2016 class. On December 14 they were recognized at a pinning and commencement ceremony at Iona College in New Rochelle, New York. The students each earned an Associate in Science Degree in Nursing and are now eligible to sit for the registered nurse licensing exam. The keynote address was delivered by Cathy Cahill, RN-BC, MS, Director, Clinical Services, Pediatric Ambulatory Subspecialty Services and Clinical Service, Dialysis Services at the Children’s Hospital at Montefiore (CHAM), and an associate of the Montefiore Einstein Center for Bioethics. Graduate Elizabeth Guadalupe presented the valedictorian remarks. Interested in becoming a nurse? The Montefiore School of Nursing will host its next open information session on February 16, 2017 at 1:00 PM and again at 6:00 PM. No registration is required to attend the information session. Contact www.montefioreschoolofnursing.org for more information. During this season of kindness and generosity, Montefiore's Engineering Department is doing more to bring some holiday joy to children's lives. In cooperation with the Child Life Program, Engineering, under the leadership of Paul Ammirato, Director, Engineering, Montefiore, organized a toy giveaway for children who are patients at Montefiore. 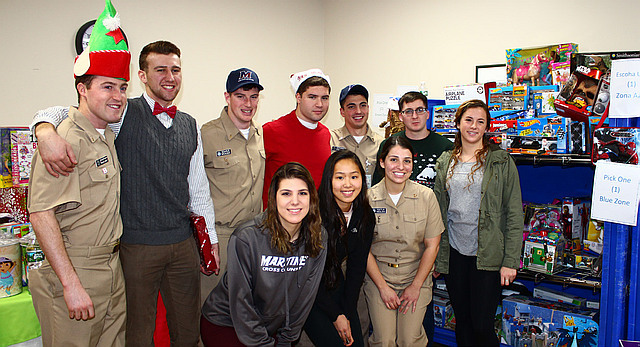 A large donation of toys was made from SUNY Maritime College's Student Philanthropy Council, a student-run organization that promotes charitable giving on campus and in the outside community. The Engineering Department has a relationship with SUNY Maritime extending back over 50 years, including the employment of more than 75 engineering graduates here at Montefiore. As of December 28, the New York State Commissioner of Health has officially declared influenza to be prevalent in New York. Montefiore associates who have not yet been immunized will now be required to comply with state regulations and wear masks in areas where they might come into contact with patients, including public areas throughout the hospital. This requirement will remain in effect until the NYS Commissioner of Health lifts the mandate. For anyone who has not yet received their flu shot, please do so as soon as possible—and encourage your friends and co-workers to do so as well. Vaccinations continue to be available on all campuses. Visit the "Flu Headquarters" section of the Intranet for vaccination locations. Researchers at Montefiore and Albert Einstein College of Medicine are conducting a study to learn how differences in the genital tract increase an adolescent’s susceptibility to HIV and STI infection versus adult women. 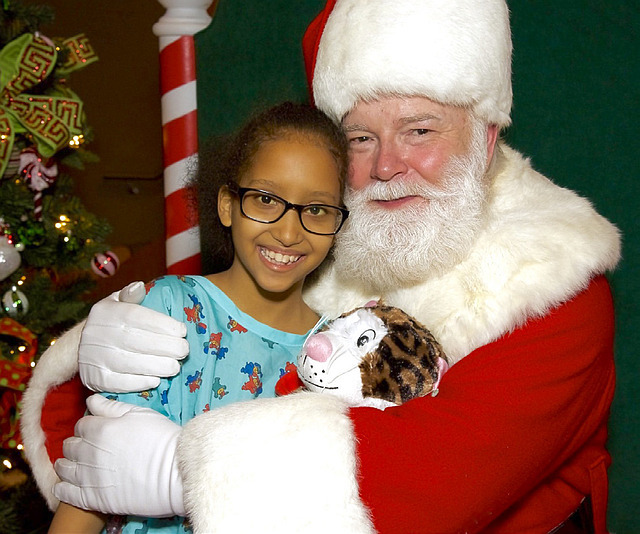 In the spirit of the holidays, won't you give generously to Montefiore to help those in need? One hundred percent of your gift will go toward patient care, scientific research and medical education. Speaker: Sayed Email Wahezi, MD, Program Director, Pain Medicine Fellowship, Montefiore. For more information, contact Tanika Fernandez at 718-920-5224.